The City of Hartsville holds Municipal Court at the Darlington County Magistrate’s Courtroom at 404 S Fourth St, Hartsville, SC 29550. What kind of tickets can be paid online here? Your ticket number starts with “201911” or “7102p“. The Agency/Troop listed vertically along the right side of the ticket reads “Hartsville Police Dept”. 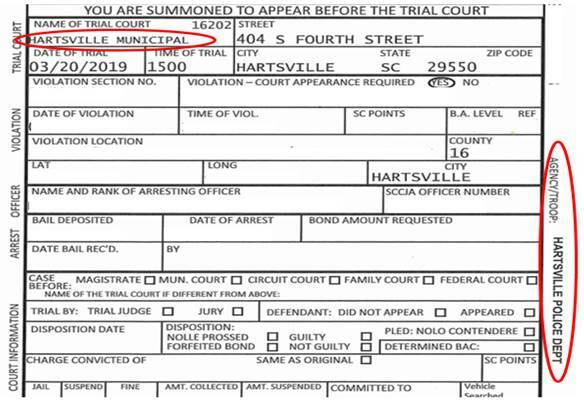 The name of the trial court on your ticket should read “Hartsville Municipal”. An example of a Hartsville Police Department Electronic Ticket. This is the only type of ticket that can be paid using this online form. We do not accept payment for tickets issued through the Darlington County Sheriff’s Department or SC Highway Patrol (State Trooper). If your ticket was through the Darlington County Sheriff’s Department or SC Highway Patrol, please contact the Darlington County Magistrate’s Office at 843.332.9661. How can I pay my traffic ticket or court fine? Pay your traffic ticket or court fine online (fees apply) using a Mastercard, Visa, Discover, or American Express card. Pay in person at Hartsville City Hall, 100 E Carolina Ave, Hartsville, SC 29550. We are open Monday through Friday from 8:30 am to 5:00 pm. We accept cash, credit card, money order, and cashier’s checks. We do not accept personal checks for court payments. Mail in payment to Hartsville Municipal Court, PO Drawer 2497, Hartsville, SC 29551. Money order or cashier’s checks only. Please do not send cash in the mail. Personal checks are not accepted for court payments. Pay by phone using a credit card: 843.383.3008 Monday through Friday from 8:30 am to 5:00 pm. Pay in court using cash, credit card, money order, or cashier’s check. Who do I make the money order or cashier's check payable to? If you pay in person, you will receive a receipt. If you pay online, your receipt will be emailed to you. If you pay by phone, or by mail, a receipt can be mailed or emailed to you upon your request. You may contact the Clerk of Court by telephone at 843.383.3008 or by email at court.admin@hartsvillesc.gov during regular business hours to verify that your payment has been received. If I pay the bond, can I still come to court and have my case heard? Yes. If the Judge lowers your fine in court or finds you not guilty, you will receive the appropriate refund via paper check. It is your responsibility to make sure we have your current address. Do I have to pay the full amount, or can I set up a payment plan? The amount must be paid in full on or before your court date. You may ask the judge for a payment plan. If approved, you must pay state-mandated 3 percent interest on the total amount due. Am I required to come to court? Certain offenses require a court appearance, even if you pay the bond amount in advance. If you are required to appear in court, this should be noted on your ticket (The word “YES” will be circled beside “Court Appearance Required”.). If you are unsure of whether or not you need to appear in court, please contact the Clerk of Court by telephone at 843.383.3008 or by email at court.admin@hartsvillesc.gov. I am required to come to court, but I cannot make it on my assigned date. What should I do? You must mail, email or fax a continuance request to the Clerk of Court. You must give a reason why you cannot attend court on the original trial date. The continuance request must be received before the scheduled date and time for your case to be heard in court. We will let you know if your request is approved, and if so, when your next court date will be. Contact the Clerk of Court by telephone 843.383.3008 or by email court.admin@hartsvillesc.gov.